The Centers for Disease Control and Prevention (CDC) reports that almost a quarter of the U.S. population lives with some form of arthritis. Daily tasks—like opening drawers, turning door handles—can be difficult, so people turn to adaptive aids. Many are small pieces of plastic. "It never ceases to amaze me what a small piece of plastic sells for," said Joshua Pearce, the Richard Witte Endowed Professor of Materials Science and Engineering at Michigan Tech. "Anyone who needs an adaptive aid for arthritis should be 3-D printing it." So, Pearce had his class take a shot. 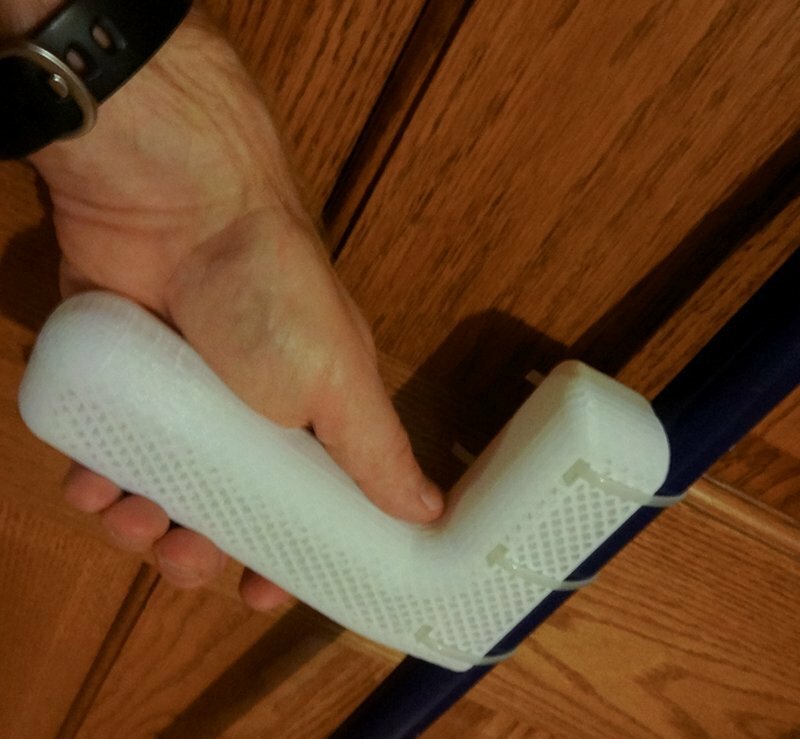 Now, Pearce is a co-author and corresponding researcher on a new study that analyzes how 20 of the 3-D printed adaptive aids his class printed see huge cost savings and either meet—or improve—standards for existing products. The study was published this week in Geriatrics and is co-authored by student research assistant Nicole Gallup and orthopedic surgeon Jennifer Bow, who is also a visiting scholar at Michigan Tech. Adults with arthritis and other rheumatic conditions earn less than average Americans, yet spend more on medical expenses: on average about 12 percent of the average family's income. To boot, the adaptive aids they may need to purchase to help them pull on socks, hold toothbrushes, knit, pull zippers, cut food and many other everyday tasks are pricey. The 3-D printed versions are not only cheaper but customizable. Dr. Bow recommended students take a look at designing adaptive aids because the customization available from 3-D printers could help her arthritis patients and others throughout the world. Subsequently, the group Makers Making Change approached Pearce because they needed to improve some existing designs that can be shrunk, expanded and tweaked to match different hand sizes, grip strengths, color preference and task modification. Cost for individual items may not be too onerous. However, following a diagnosis, some patients need to overhaul or install many adaptive aids, like putting light switch flippers throughout the house, which adds up quickly. 3-D printing can trim that cost, and Pearce's team only used printers that cost $500 or less, but the upfront cost of a printer may curb some people's enthusiasm. Also, some people do not have to pay the full price for adaptive aids if Medicare or their insurance policy helps cover the purchases. Pearce says neither substantially affects the numbers. "We printed and analyzed 20 different products and each one has a great return on investment, even for people who can use insurance to purchase adaptive aids with a co-pay, and a printer pays for itself easily," Pearce said, explaining that the true challenge is not economic. "It's a slam dunk—but the question becomes how do people get these aids?" We're not saying an 85-year-old with no personal computer experience is developing a CAD from scratch and prototyping a design 12 times," Pearce said, explaining the open source designs are available for free online at Appropedia and MyMiniFactory. Pearce sees nursing homes, doctor's offices and physical therapy clinics as the ideal hubs for 3-D printed adaptive aids. Local makerspaces and libraries also provide access to printers, designs and knowledgeable people in exchange for fees that cover plastic and printing costs; some businesses even make a living providing 3-D prints. With that dream in mind, Pearce says his class started with base functionality. Their assignment—turned around in a week— was printed on Rep-Rap printers that the students built themselves in the first two weeks of class. They did all their adaptive aid prints with PLA plastic, focused on handheld items, and many of the students designed features with a loved one, friend or acquaintance in mind. They all work, but there's always room for improvement. "All the designs could be made much prettier and better—and that's the beauty of open source. Because I hope in a couple years that we have a whole array of each one of these ideas that's built out much further, applied all over the world and customized for individual people," Pearce said. "This is a new field of 3-D printing design that's just getting started. Lots of people can make real, honest-to-goodness, concrete contributions."